Heineken is back as official malt beverage of the 17th annual Ultra Music Festival electronic dance music concert in Miami this weekend. The event, which began in the South Florida city, is now also a global Ultra electronic music series, with concerts in locales like Brazil, Chile, Ibiza, Japan, Croatia, South Korea, Buenos Aires, and South Africa. 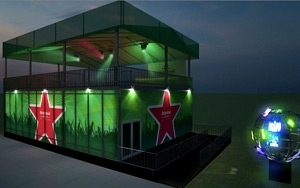 As it did last year, Heineken will have its Heineken House installation, a combo interactive experience and bar/hangout. Heineken's program includes a consumer experience that connects visitors to a chance to be an interactive DJ in a electronic dance music-themed space. Festival attendees can control lights and a video wall through interactive touchscreens, per the company. Heineken will distribute RFID wristbands for photo-sharing and creating their own custom DJ names. The venue will also have an art piece displaying Ultra content from around the world. The Amsterdam-based brewer says the Heineken House offers views of the concert's Worldwide Stage, and has a first- and second-floor bar. Heineken will also host a scavenger hunt in Miami as part of a collaboration with music influencer DJ's Junior Sanchez, A-Trak and Ryan Hemsworth. The focus of that relationship is a one-off custom bottle edition. Heineken will hide the limited-edition bottles of beer around Miami. Those who attend the festival are encouraged to follow clues that Heineken and the DJs are dropping on their Twitter accounts. In 2014 the multi-year sponsor ran a “FestivalFamous” program, where Heineken challenged fans to take close-up photos of as many acts as possible, and share via Instagram tagged with #HeinekenHouse. The winner got to go onstage with a DJ. The other sponsors this year are PepsiCo's 7UP, Sirius XM, Blu electronic cigarettes, Moet & Chandon, and Pioneer. Social video platform Twitch is official broadcasting partner. 7UP will serve as exclusive sponsor of Twitch's live stream of the festival, per a release. Last year's concert brought in about 160,000 people, and a threat by Miami officials to end the series after a melee, general unrest and serious injury to a security guard. In Asia, the series is expanding to Thailand.